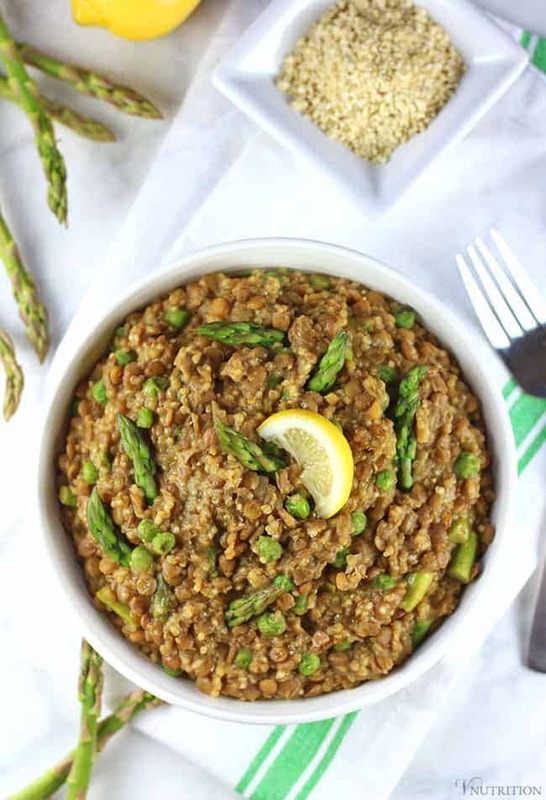 This Lentil Quinoa with Asparagus and Peas is a gluten free and tasty whole-foods dish using spring produce. It’s a one-pot meal so there’s not much cleanup – it’s a win-win! When spring arrives I get so excited that the cold winter is over…but every year I’m reminded that just because it’s technically spring, the weather does not have to cooperate. 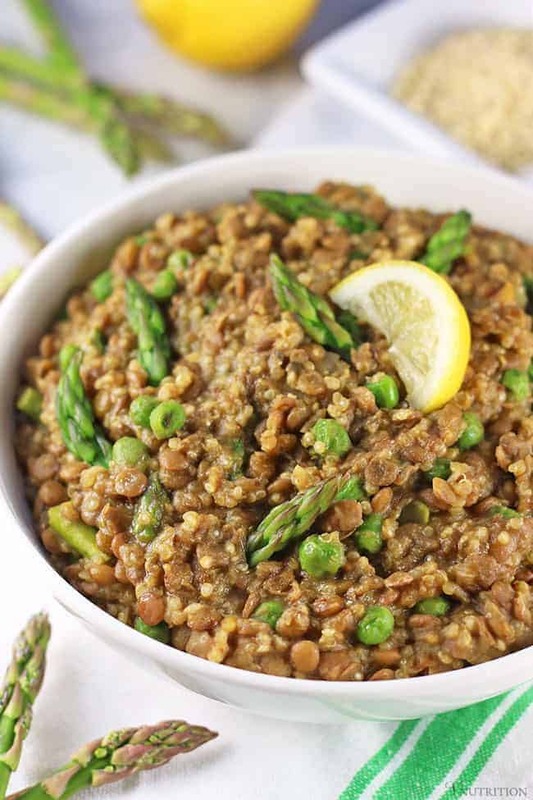 We’ll still have some chilly days ahead here in the northeast (whether I like it or not) so my Lentil Quinoa recipe today is both spring-ish and cozy. I’ve been craving lots of comfort meals like my creamy Vegan Pumpkin Pasta and my Vegetable Bean Casserole because of the chilly weather we’ve been having on and off for the past few weeks. And while I’ve really been enjoying those recipes, I wanted to add some spring veggies into the mix to keep my meals more seasonal. Spring veggies include onion, leeks, peas, asparagus, artichokes, spinach, and rhubarb to name a few. Lentils are one of my favorite beans. 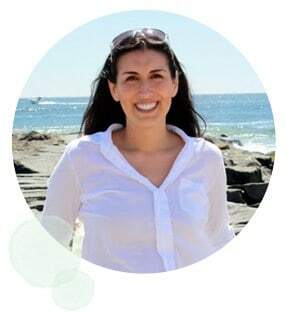 They’re easy to make and they’re actually easier to digest than other beans which could be beneficial to know for those who are having a little more digestive issues while adding beans to their diet. I actually take digestive enzymes with most of my cooked meals to aid in digestion. Lentils and aren’t as big as other beans so I’ve always felt they are less “beany” if that makes any sense (which maybe it doesn’t, I’m a little weird). I bring this up because while sometimes people don’t like larger beans like white beans or kidney beans, lentils might be an option as a “starter” bean for anyone trying to add more beans to their diet. For this dish, I chose to use asparagus and peas. I thought the flavors and textures would go nicely with the beans and grains. To keep things cozy and a bit creamy, I cooked them with some coconut milk. To season my Lentil Quinoa, I added in lemon juice (lemon always says spring/summer to me), Dijon mustard, and dried parsley. I think all the flavors come together well and I am excited to share the recipe with you. Of course, I top it with some of my Parmesan Cheese Alternative too because I’m obsessed with that stuff. This is a one-pot dish for those of you who don’t like to do too many dishes…so I guess that would be everyone! I hope you enjoy my Lentil Quinoa. If you get a chance to try it out, please rate the recipe and leave me a comment below – I’d love to hear your thoughts. Share your pictures on Instagram too and tag @v.nutrition and #vnutrition so I won’t miss it! 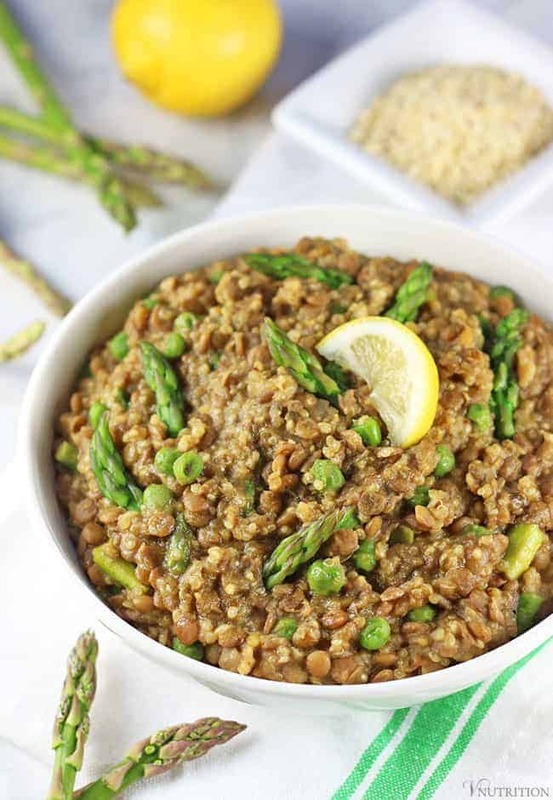 If you make this One-Pot Lentil Quinoa recipe, let me know what you think by ★ star rating it and leaving a comment below. 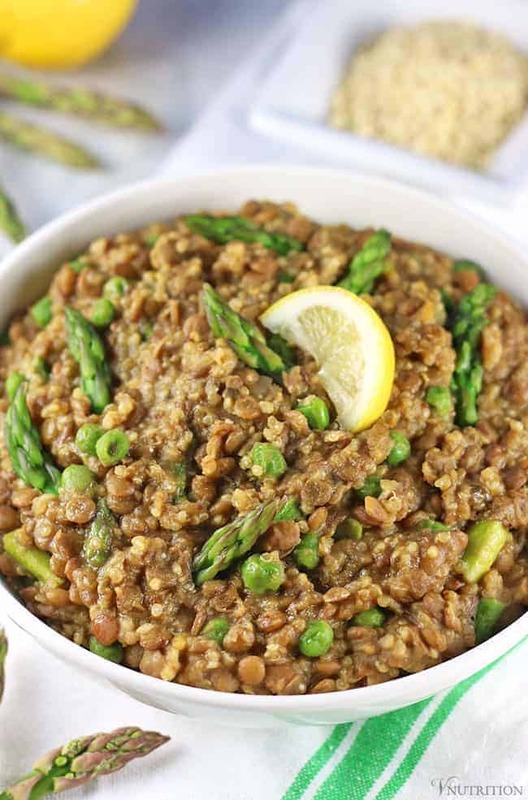 This Lentil Quinoa with Asparagus and Peas is a tasty whole-foods dish using spring produce. It’s a one-pot meal so there’s not much cleanup – it’s a win-win! In a large saute pan (that has a lid) or pot, add olive oil, onion, and garlic and cook until onion translucent (about 3-5 min). If using veggie broth instead of oil, add enough broth to just cover the bottom of the pan and add more if/when needed. Add 2.5 cups of vegetable broth and lentils. Bring to a boil, cover and cook on medium-low heat for 15-20 minutes until lentils are tender. They don't have to be fully cooked because they will continue to cook with the other ingredient but you want them mostly done. Add quinoa and coconut milk, cover, and cook for another 15-17 minutes. Make sure to check every so often stir, and if needed, add a bit more broth so nothing is sticking to the bottom of the pan/pot. Add in nutritional yeast, lemon, Dijon, parsley, and tamari and stir. Add asparagus and peas (and more vegetable broth if needed - I've put in anywhere from 1/4-1/2 a cup - don't put too much at once, you don't want too liquid) and cook uncovered for about 5-10 minutes (stirring frequently) until asparagus is tender and as much of the liquid has been evaporated for your liking. Are you a bean fan? What’s your favorite bean? Ohhhh you always make recipes that I have all the stuff for already! This is on my list! Love this! I always use lemon to brighten up a dish too – totally spring-like! Looks super tasty! This looks like a perfect weeknight spring dish. Thanks Becky! I’m all about spring coming in! I love all the ingredients in this dish, so I bet I’m going to love this recipe! Thanks Amy! I hope you do! Yum, this looks wonderful and I love that we have most of it on hand too. I am a fan of one pot meals, especially with lentils and quinoa, thanks! True on spring weather here too, little glimpses of warmer days, then chilly rain the next. Thanks so much Christine! 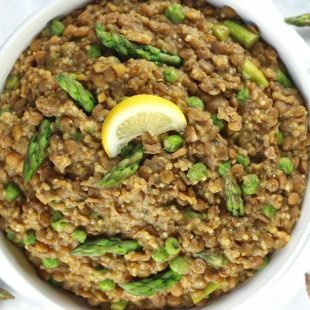 Lentils and quinoa are some of my go-tos! I totally know what you mean about being all set for spring, but then the weather doesn’t always agree with the calendar. We’ve been known to get snow in April & May on occasion, and it’s always a big bummer! This dish looks super cozy and a great way to enjoy some of the seasonal spring produce while also being cognizant of the chilly temperatures. A perfect compromise! Thanks Cadry! That’s what I was going for, so glad you get it! Oh I’m totally loving this one pot meal! Spring is in the air!! Thanks Kimmy! It worked out well. Let me know what you think! These flavors are perfect for spring! (And I’m happy to say we’ve finally got peas back on our safe list after another round of allergy testing for Jonathan!). Yum! Oh good! I’m glad Jonathan can eat peas again. I know you’ve been having trouble with different foods for him. Thanks so much Sarah! This sounds wonderful! I love one pot meals. This sounds awesome! 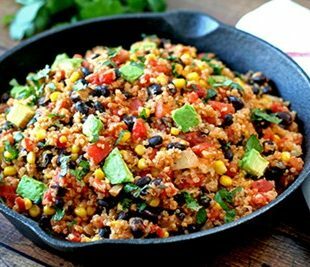 I love quinoa because there’s so much you can do with it! And I hear ya on the weather- down here spring can’t make up its mind. One day we are wearing tanks and the next day I have to pull out my heavy coat, it’s insane! This dish is perfect for spring! I am hoping to find some fresh asparagus at our first farmers market tomorrow, fingers crossed! Have a great weekend! Thanks Alison! Ooh, our farmer’s market won’t open for another month so I’m jealous! Have a great weekend! On first glance I thought it was a rice pilau and then realised its quinoa. I have to experiment more with quinoa as used it mostly to bulk up my veggie burgers. This really looks good and my husband would love it too as it has asparagus in it. Yes, it does look like a rice pilaf. I’m obsessed with quinoa so I used it in a lot of my cooking but have not yet tried it in veggie burgers yet. I’ll check yours out! Hi Sally! I’m really glad you liked the taste. My coconut milk is 400ml too. I’ve made this numerous times and each time I had to add or subtract a little veggie broth depending on how the lentils and quinoa cooked that day. I’ll make a note to cook down the liquid more especially if someone wants it as thick as the pictures. Thanks so much for bringing that to my attention. I got the link to this recipe from tinned tomatoes’ blog. I was so excited to see a recipe featuring pears and got really grumpy when I didn’t see pears in the ingredients list; I should have stopped to read the recipe name properly. I love the look of this recipe even if it doesn’t have pears in it – it’s full of good things and is going onto my to do list for this weekend! Thanks for sharing. Is there anything you can substitute in place of the coconut milk? Hi Shell! I would think you could substitute it with any kind of non-dairy milk – though I haven’t tried it myself. 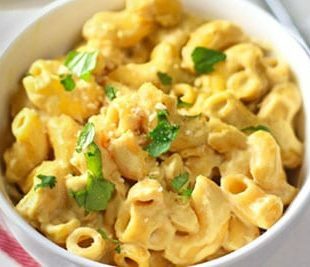 I used coconut milk because it’s makes it extra creamy and a bit thicker. If you do give it a try with another milk, let me know how it turns out! That’s a great idea! Cashew always adds that extra creaminess! Is that the 13.5 oz. can of coconut milk? 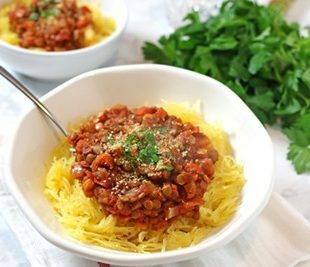 I am new to vegan cooking and am always looking for new recipes. I made this and was so happy I did! Delicious and creamy. Tonight will be my second time making it in two weeks. Thanks for the great recipe! Delish! I didn’t have asparagus so I used broccoli instead. Yummy. I will make this again. Oh my goodness….this is crazy delicious! I almost never follow recipes, and I can’t remember a time that I followed a recipe and turned around and made it again! I will certainly be delving into the rest of your recipes. Thanks for an EASY and delicious vegan meal! Beth, I’m so glad you enjoyed it twice! That is so great to hear! Thank you for letting me know! Thanks Mary; this was yummy! I also added some other things that really brought flavor in the lentils like coriander, turmeric, and ginger powders; and I added carrots with the asparagus. This was an amazing dish to play with! It was so hearty!